When it comes to shoes, I always believed that if they weren’t at least 3.5 inches high then what was the point. I have shoes that are 6 inches high, block heels, wedges, you name it. But the one style I did not own was Kitten Heels. I have never been a fan of theses shoes as they always reminded me of elderly church ladies who can no longer wear regular heels. I have never understood the appeal of this style of shoe. Honestly, whose idea was it to come up with this design? What purpose do heels that low serve? Rumour has it that the Kitten Heel is back in Vogue. This style of shoe was made popular in the 1950’s by Audrey Hepburn, and more recently Michelle Obama, Hillary Clinton and Theresa May have been seen wearing them. They were originally introduced as trainer heels for young teenage girls as higher heels were deemed inappropriate. Kitten Heels are typically lower than 2 inches. I mean what is the point? When I was younger I always thought that Kitten Heels were for tall women who didn’t want to look too tall when they wore high heels, but still wanted to wear some form of heeled smart shoe. There have been many debates about whether or not kitten heels are actually stylish or attractive footwear. You either like them or you don’t. 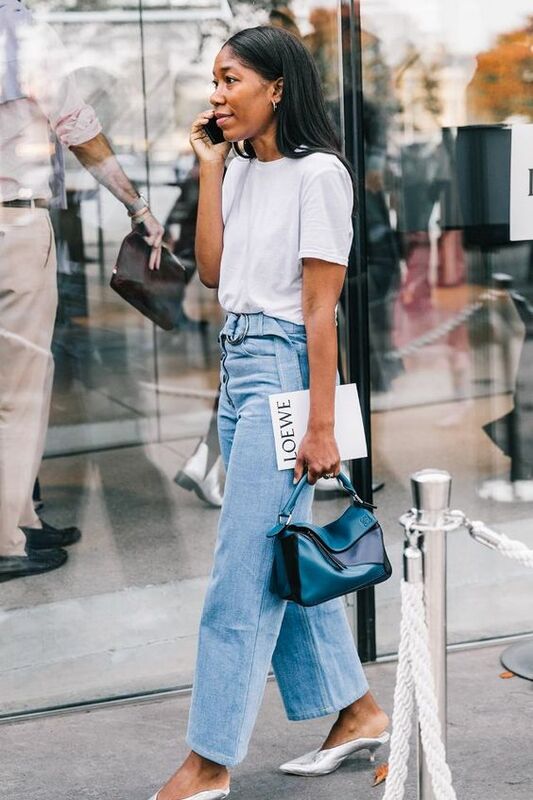 I have always been firmly in the dislike camp…….That is until I saw the colourful Kitten Heel mules that were featured in street style photos. Some were embellished with dainty bows others were made of satin. They were everywhere during Spring/Summer and they are still going strong for Autumn/Winter. You can find kitten heels on ankle boots and court shoes too. The red ones that I am wearing are by Carvela, but I purchased them from good old ASOS, and I have to say they are very comfortable indeed. I have definitely been won over. I’m not saying that I will only wear kitten heels from henceforth, but I am definitely open to buying another pair. I have my eye on the Balenciaga Knife Mules in any one of the many colourways. As you can see from the images above Kitten Heels can be worn with dresses, skirts, trousers or jeans. They are no longer the reserve of women of a certain age. Now everyone is sporting them no matter their age. It’s sort of a Granny Chic style.